Who needs a peep hole when a wifi network will do? 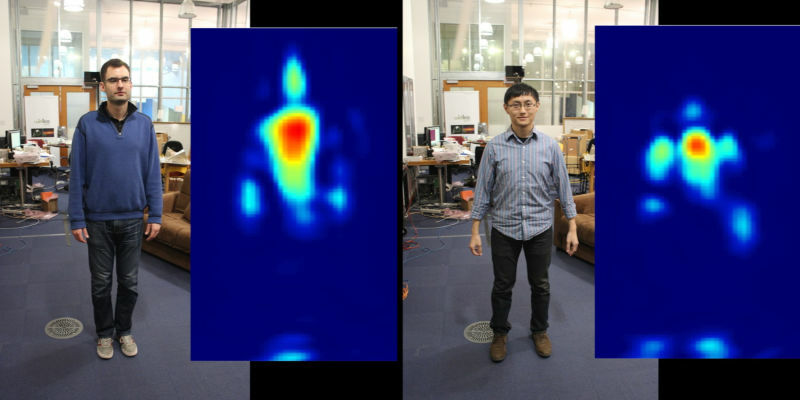 Researchers from MIT have developed technology that uses wireless signals to see your silhouette through a wall—and it can even tell you apart from other people, too. The team from MIT’s Computer Science and Artificial Intelligence Lab are no strangers to using wireless signals to see what’s happening on the other side of a wall. In 2013, they showed off software that could use variations in wifi signal to detect the presence of human motion from the other side of a wall. But in the last two years they’ve been busy developing the technique, and now they’ve unveiled the obvious — if slightly alarming — natural progression: they can use the wireless reflections bouncing off a human body to see the silhouette of a person standing behind a wall. Not only that, the team’s technique, known is RF-Capture, is accurate enough to track the hand of a human and, with some repeated measurements, the system can even be trained to recognise different people based just on their wifi silhouette. The research, which is to be presented at SIGGRAPH Asia next month, was published this morning on the research group’s website. So how does it work? It’s actually relatively straightforward: a device transmits wireless signals on one side of the wall, which propagate through it and are then reflected by bodies on the other side. The device then captures the reflections, which are passed to software to be cleaned up. As you might expect, this part requires some pretty serious processing, as different body parts, humans and objects introduce all kinds of interference. Given the small amount of information that’s received in the reflections, the system keeps constant track of what it can identify: sometimes it might be an arm and a head, other times a torso and a leg. It’s capable of stitching these glimpses together, in turn forming a full human silhouette. And given the world is made up of humans with a wide variety of body types, that data can be scrutinized a little further. 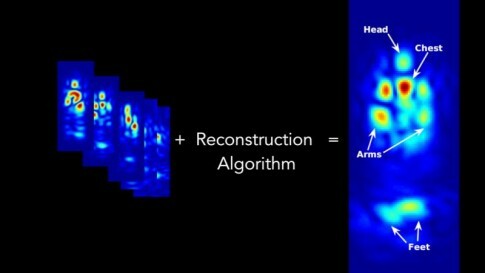 In fact, the team has been using distinctive measures from these images, such as height, shoulder width and other body shape metrics, to identify different humans hiding behind a wall. In a series of tests, they’ve shown that the recognition capability can distinguish between 15 different people through a wall with nearly 90 percent accuracy. And in another series of experiments, where the team simply tracked the patterns they were capturing, they were able to trace a person’s hand as they wrote in the air. “The accuracy of tracking the moving hand is about an inch,” explains Adi. The team is, understandably, excited about the applications that this kind of technology could provide. They’re already working, for instance, to develop a device that could sit in the home of your elderly grandparents, constantly scanning the house for their presence; if they were observed to have fallen over, the system could phone 911 on their behalf. 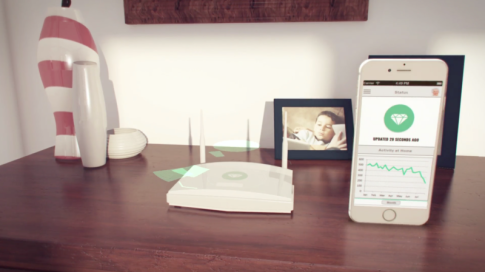 If they can achieve that kind of detection, they suggest the technology could allow your smart home to sense your motion to, say, control video-games, control appliances depending on the way you move, or even perform on-the-fly health checks.